World champion New Zealand humiliated Australia 42-8 to open the Rugby Championship on Saturday and extend the All Blacks' recent dominance over its Bledisloe Cup rival. New Zealand scored six tries as it dismantled the Wallabies, which lost centers Matt Giteau, Rob Horne and Matt Toomua through injury — all inside the first half. Man of the match Beauden Barrett scored a try, set up two others and kicked 12 points to lead New Zealand to a comfortable victory in its first meeting against Australia since the Rugby World Cup final last year. Nick Phipps scored a late try for the Wallabies in a rare highlight on an otherwise humbling evening at Sydney's Olympic Stadium, which saw the Wallabies suffer its largest losing margin against New Zealand at home. "We really wanted to focus on our attitude and preparation," New Zealand coach Steve Hansen said. "Whilst it wasn't perfect, it wasn't too bad, was it? So I am very proud with the way the boys arrived for the kickoff and mentally we were right on the button and, when you're like that and you've got a bit of talent, you can do things." It was a night the Wallabies will want to quickly forget as it lost Giteau early to an ankle injury, then his replacement Toomua to a head knock, before Toomua's replacement Horne also left the field with what appeared a serious arm injury just before halftime. The injuries couldn't obscure a particularly poor performance by the Wallabies — which had recalled several overseas-based stars for the Rugby Championship — as it gifted away possession to the All Blacks regularly, kicked poorly and missed several tackles in defense. "I thought we defended very poorly," Wallabies coach Michael Cheika said. "Defense is attitude, so there's no rustiness. Let's get that one out of the way straight away. When players run, you've got to tackle." The Wallabies had a short-lived lead early in the match after Foley's penalty, but gave up a soft try for New Zealand's Ryan Crotty in the sixth minute. 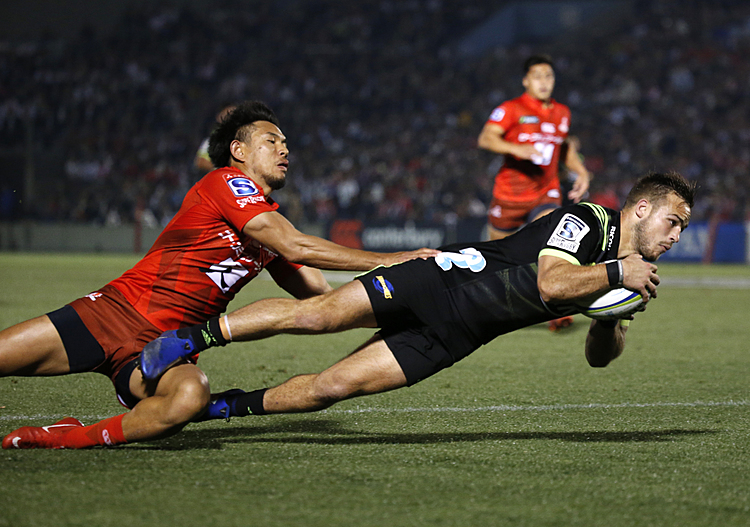 Crotty beat attempted tackles by Dane Haylett-Petty, Giteau and a desperate effort by Will Genia to score. Barrett converted the try for a 7-3 lead. 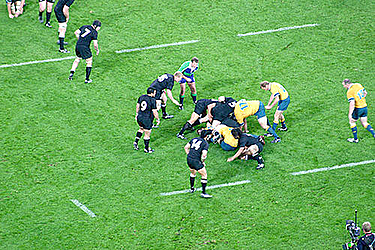 The world champions then added another two penalties, before Barrett raced through an opening in the Wallabies' wide defense to score another easy try. 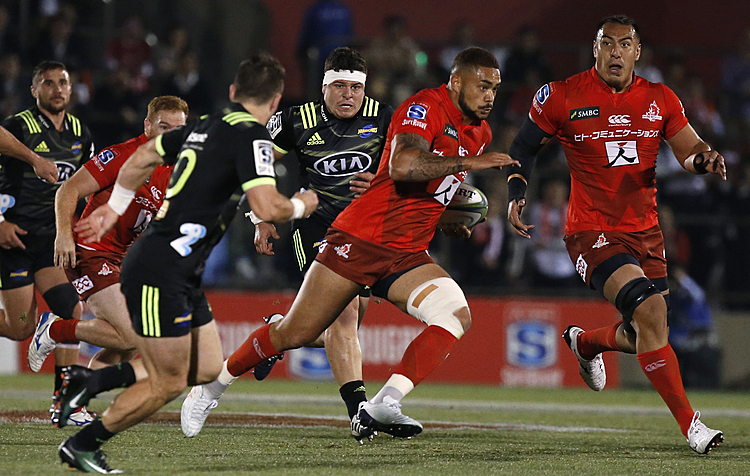 The flyhalf kicked the conversion as the All Blacks took a 20-3 lead after 26 minutes. The Wallabies' injury woes worsened minutes later as Toomua suffered a head injury trying to tackle Barrett and was replaced by Horne. The contest was effectively over after half-an-hour as Foley's clearing kick was charged down by Jerome Kaino and the All Blank flanker chased after and gathered the ball before diving over for New Zealand's third try and a 25-3 lead. The rout continued with winger Waisake Naholo scoring just before halftime after Barrett made a break through the middle of the Wallabies' defense and passed inside to Naholo, who sped past Ben McCalman and Israel Folau. Barrett added the extras for a 32-3 score at the interval to leave the majority of the 65,328 crowd stunned. New Zealand picked up where it left off in the second period when Dane Coles — who replaced Codie Taylor in the first half — reached over, following an earlier dropped ball by Tevita Kuridrani. Almost straight from the restart, New Zealand attacked again with Barrett playing in Julian Savea who scored acrobatically in the corner as the score reached 42-3 and. A yellow card to All Blacks No.8 Kieran Read in the 73rd gave the Wallabies a brief period of attack and substitute Phipps found space out wide to score. The teams meet again in Wellington, New Zealand on Aug. 27, where the All Blacks will have the chance to secure the Bledisloe Cup which it has held since 2003. "I know the scoreboard was big but it was a tough game and a couple of things you have to look at: A lot of the Australian boys haven't played for a long time and that makes it difficult and some nights everything goes your way and it doesn't for the opposition," Hansen said. "But we've been here before ourselves, we've taken a bit of pasting and then the next game turned it round. So we will be expecting them to turn it around next week ... you don't win the (Bledisloe) Cup until you've got both hands on it."